The Japan Maritime Self-Defense Force amphibious tank landing ship Kunisaki (LST-4003) approaches the port of Da Nang, Vietnam, in 2014. 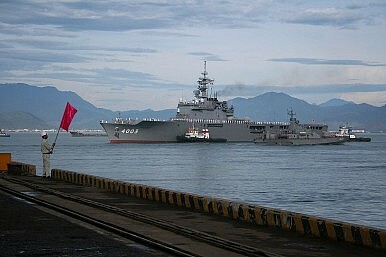 China’s claims to the South China Sea are accelerating a trend of growing security cooperation between Japan and ASEAN. Japan and China are among the biggest powers in Asia, and both consider their relations with Southeast Asia to have strategic significance. The two countries vigorously compete with each other in asserting their overall influence on the region. However, in terms of maintaining stability and security for Southeast Asia, while Japan is moving in a mutually beneficial direction that is largely supported by Southeast Asian nations, China is doing the opposite. Beijing increasingly appears to be a security threat for the region due to rising tensions with ASEAN states over territorial disputes in the South China Sea. Below, I outline the history and trends of both China and Japan’s engagement with Southeast Asia, and how the South China Sea disputes are affecting their rivalry in the region. Japan-Southeast Asia security relations began in the colonial period, when Japan implemented its Greater East Asia Co-prosperity Sphere, which in fact was a cover for Japanese expansionism aimed at exploiting natural resources in Southeast Asia. As part of the U.S. Cold War strategy to contain Communism, Japan became an industrial hub and driving force for East Asia’s economic growth. This resulted in Japan’s restoration of economic relations with Southeast Asia as well as turning the region into a shield against Chinese Communism. Under Prime Minister Shigeru Yoshida (1946-47, 1948-54), Japan focused on a policy of economic diplomacy with limited involvement in Southeast Asia’s security affairs. Japan continued its minimal involvement in the political and security affairs of Southeast Asia through 1974, with two minor exceptions. Tokyo participated in international peace observation in Indochina in 1968, and sent a mediation team in 1970 to end the Vietnam War. The 1975-1989 period witnessed a fundamental change in Japan’s policy to Southeast Asia. Japan began considering relations with ASEAN countries as of vital significance to its foreign policy in Southeast Asia. In Japan’s view, ASEAN was an important institution for regional political stability and as a key source of economic security, resources, markets, investment and maritime communication. Moreover, ASEAN also played a vital role in the regional balance of power because the organization’s members at the time (Indonesia, Malaysia, the Philippines, Singapore, and Thailand) were anti-Communist and enjoyed good relations with non-Communist states. In 1977, Japan initiated the Fukuda doctrine that confirmed Tokyo’s willingness to act as a mediator between ASEAN and Indochina and assist in constructing a stable order for Southeast Asia. Japan had volunteered itself for a larger role in Southeast Asian security. In the post-Cold War period, Japan continued enhancing its security relations with Southeast Asia by seeking deeper involvement in regional affairs. Japan’s relations with Southeast Asia moved beyond economic cooperation to become more engaged in political and security issues in the region. One of the outstanding contributions Japan made to regional security in the 1990s was its support for ASEAN to establish the ASEAN Regional Forum (ARF) in 1994. This was the first multilateral security dialogue discussing security issues and regional stability in Southeast Asia. Generally speaking, Japan has become an active participant in multilateral security affairs in Southeast Asia and maintained a positive security influence on the region since 1975. Japan played the role of a mediator in the territorial disputes over the South China Sea as far back as 1995, when China constructed permanent structure on Mischief Reef. Japan urged China to handle the dispute with the Philippines peacefully. Japan has also become an active contributor to other Southeast Asian security affairs, especially in terms of human security. Due to its military occupation of Southeast Asia during World War II, Japan today seeks to avoid a direct military engagement approach toward regional security issues of the region. Instead, Tokyo relies on human security cooperation as a way to further its security role beyond economic influence in Southeast Asia. Besides providing long-term official development assistance, which effectively helps Southeast Asian economies to generate growth and jobs, Japan has actively contributed to and participated in disaster relief and peacekeeping activities in the region. This includes providing financial assistance in the aftermath of the 1997-98 Asian financial crisis to stabilize the regional economies and restore social and political stability, peacemaking operations in Cambodia and Aceh, and peace building in Timor-Leste, Aceh, and Mindanao. Another good example is Japan’s proactive role in joint training, information-sharing, fact-finding, and joint patrolling with Malaysia, the Philippines, and Singapore to combat piracy in the Malacca Strait. Given its continuously active contributions to and participation in regional security issues, Japan has been successful in building trust and confidence in its security relations with Southeast Asian nations. In the perception of ASEAN nations, the image of a militaristic Japan in World War II has gradually been replaced by a more reliable and trustworthy Japan. Meanwhile, China’s relations with Southeast Asian nations before 1990 were characterized by instability and distrust because of China’s support for insurgencies in Malaysia, the Philippines, Myanmar, Thailand, and Laos. In fact, fears of Communist China helped led to the creation of ASEAN in 1967. Tensions between China and its neighbors in Southeast Asia, especially Vietnam, the site of China’s last war, lasted for decades. In the early 1990s, however, China started to change its foreign policies toward Southeast Asia, with an aim to foster economic growth and try to make regional nations regard China as a responsible power. China has also began participating in ARF and ASEAN Plus Three as part of its stated commitment to multilateral security cooperation. Apart from seeking institutional engagement with the region, China has actively maintained bilateral security cooperation with many ASEAN nations (e.g. Chinese and Thai special forces hold joint exercises; annual China-Singapore defense policy dialogue, etc.). In 2002, China signed the Declaration on the Conduct of Parties in the South China Sea to ease fears about Beijing’s unilateral actions from ASEAN states that have competing claims in the South China Sea. However, China’s security outreach to Southeast Asia hasn’t quelled concern over the massive military build-up underway in Beijing. Since 1988, China has continuously increased its defense budget, by double-digits in most years. The money has gone to vigorous modernization of China’s armed forces, especially the navy, air force, and missile forces. In addition, China established a new naval base on Hainan Island, which is close to Southeast Asia. China’s military build-up combined with its U-shaped claim over the South China Sea, has created anxiety and security uncertainty for the region and forced Southeast Asian nations in an unexpected arms race with Beijing. The territorial disputes between China and Southeast Asian nations have also prevented China and ASEAN from fully implementing regional efforts in dealing with common issues, such as navigational safety, environment protection and piracy. In the case of security ties with ASEAN, China’s loss is Japan’s potential gain. Tensions with China over territorial disputes in the South China Sea have forced some ASEAN states, especially the Philippines and Vietnam, to turn to external alliances as a way of strengthening capabilities to counter China. In the case of the Philippines, in addition to enhancing military ties with the United States, the Philippine government is considering Japan as a strong security partner. From Japan’s strategic view, there’s good reason to strengthen security cooperation with Vietnam and the Philippines. Vietnam has the region’s second longest coastline and is an ideal choice for maritime security cooperation. The Philippines, meanwhile, occupies one of the world’s most important and busiest sea lanes of communication with its widespread maritime territories. More than 80 percent of the crude oil and 60 percent of the energy supplied to Japan go through this sea lane. In fact, Japan has already moved to cement its security cooperation with the Philippines and Vietnam. Japanese Prime Minister Shinzo Abe’s paid visits to the Philippines and Vietnam in 2015 and 2013. During these visits, Prime Minister Shinzo Abe proposed enhancing bilateral cooperation, which included maritime security cooperation, defense capacity building, and human resource development with his counterparts in Manila and Hanoi. Japan has also provided defense technology, offering 10 multi-role response vessels to improve the Philippines’ surveillance capacity along with high-tech communication system for maritime safety. Likewise, Japan is providing six maritime patrol vessels to Vietnam. Along with Japan’s improved economic, political and diplomatic relations with the region, Japan’s security relations with Southeast Asia have become more active over recent years. In return, Japan has gained more trust and confidence from Southeast Asian nations as all parties seek to cope with emerging challenges facing the region. By contrast, China is viewed threat to stability and security for Southeast Asia due to its military build-up and ambitious sovereignty claims, which have been strongly opposed by many ASEAN states. As a result, Japan’s security cooperation with Southeast Asian nations is likely to continue apace, while China’s ties with the region will be hampered by growing tenions. Anh Duc Nguyen currently works for the International Cooperation Department of Vietnam, and previously worked for Vietnam’s Ministry of Defense as an analyst. The views expressed here are his own. The South China Sea is a large part of Tokyo's calculations, but aid to Manila and Hanoi has a decades-long history. Japan’s Foreign Policy in the Mekong RegionJapan and India: Concerted Efforts at Regional DiplomacyHow Japan Plans to Counter China in Southeast AsiaJapanese Defense Diplomacy and ASEANChina: Pushing the Envelope in the East China Sea?